Nearly all of my published work in the realm of business involves positive communications. Whether you sell to prospects, manage a team, serve customers, or simply want to develop better relationships in business… and in life, there’s no skill that’s more important than the ability to communicate superbly. Download the PDF: "13 Things Nobody In Your Office Should Ever Say. And What They Should Say, Instead." To see what I mean, just start by substituting the “Power Talking” phrases in place of these 13 common words and expressions that undermine your communication effectiveness. 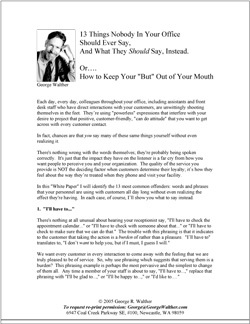 Download the PDF: "50 Ways to Say What You Mean and Get What You Want"
There are certainly more than 50 word substitutions that enhance your ability to project a positive image, create more cooperation, and give yourself mental and verbal advantages in life and business. Download this PDF chart as a starting point and simply substitute the suggested “Power Talking” phrase at every opportunity.